Since we are out of chicken breast, smoked salmon on an onion bagel seemed like a good idea. As planned, we dropped the tomato. 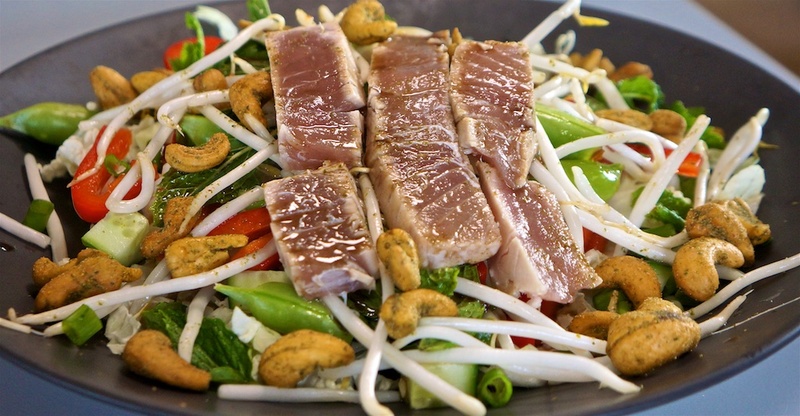 Tonight we did a d0-over of the Crunchy Thai Salad with Seared Ahi Tuna. Unlike leftovers, this was a complete fresh do-over of the same meal. As it did last night, dinner tonight cost $5.74. Foodie Philip managed to finish tonight’s meal. Back to our standby lunch: chicken wraps, but with avocado instead of hummus today. The $10.99 chicken is broken into quarters, and one breast is shared for lunch wraps, or $1.37 a serve. The edamame side salad is $2.46 for four serves, or 62c per serve. Jamie Oliver’s Crunchy Thai Salad was a favorite of ours a few years back, but we haven’t had it for a while, largely because it makes too much salad! We simplified a little, leaving out the bock choy and cilantro, but added Chili Lime Cashews for a little extra crunch. This is an amazing salad, and the tuna was good quality for the price. Dinner tonight cost $5.74. It’s a huge meal and neither of us completely finished the serving. Another Burbank Monday; another In and Out Double Double. Time for the remainder of the Beef Stroganoff. We added a little more sour cream as liquid had been absorbed by the noodles. 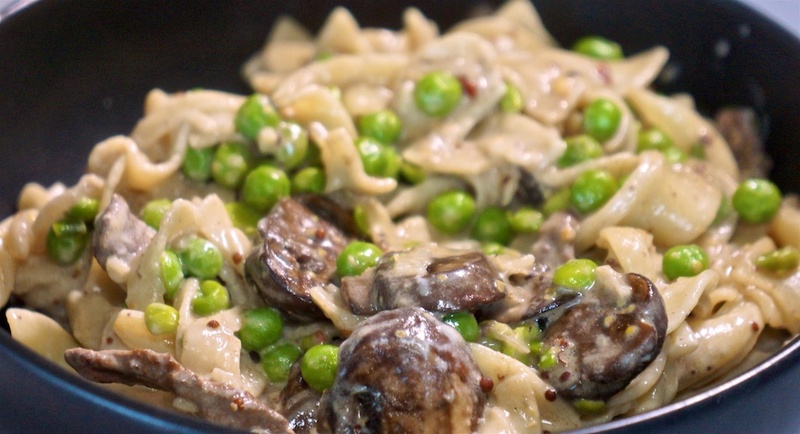 We also added a few peas for some textural variety and to have some vegetable in the dish, as we had finished the asparagus. Dinner tonight cost $3.71 per serve. Although it was Sunday we decided to get a chicken and do wraps for lunch. 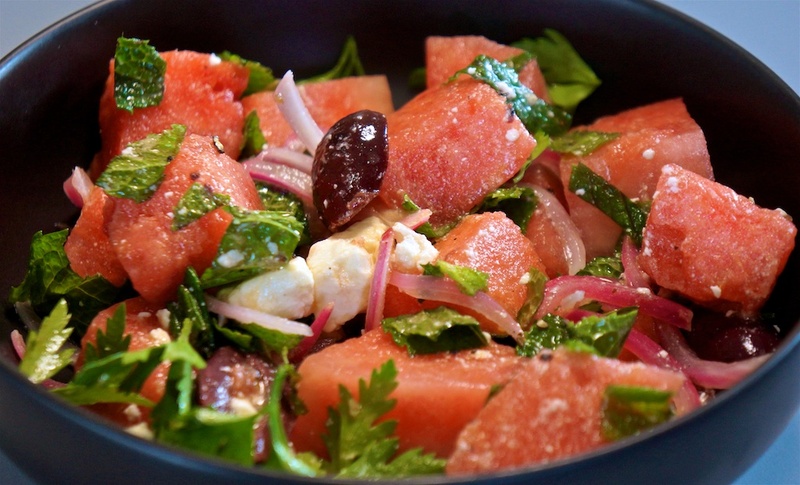 On a hot summer night, it’s hard to find a combination that’s tasty and doesn’t generate too much heat. 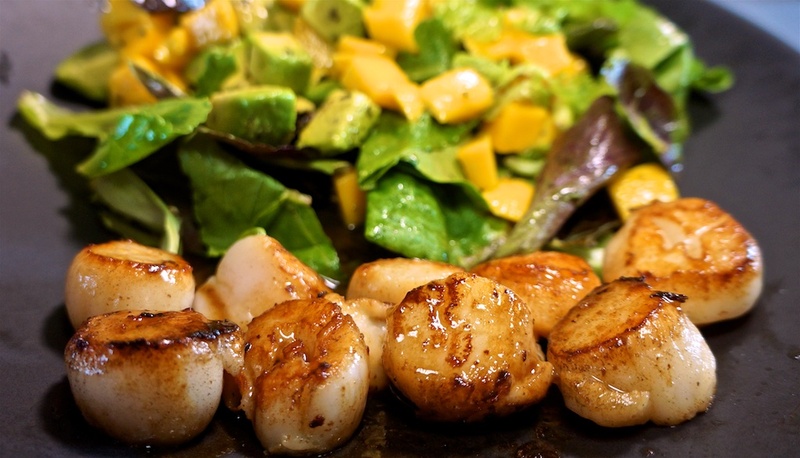 Pan seared scallops with a butter ponzu sauce accompanied by a tasty Avocado, Mango and Arugula salad , seemed like it might fit the bill. Add 25c for butter and ponzu. Dinner tonight was, as this dish always is, extremely tasty and cost $9.24 per serve. Take some bacon and fry it to taste, which for us is somewhat less crispy than seems to be standard in the US. Spread some guacamole on a wholemeal roll, add tomatoes, baby greens and the bacon. Yum! The spicy guacamole was on special for $1.99 for 8oz. Each serve was about one ounce, so 25c per serve. Lunch today was delicious and cost $1.60 per serve. 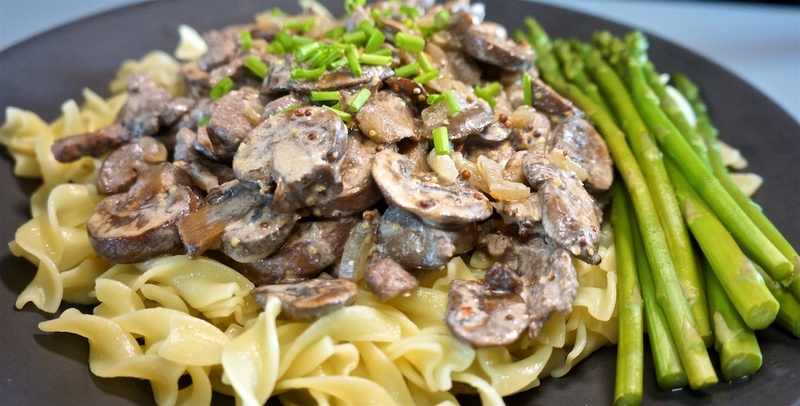 Time for a reprise of the Beef Stroganoff using the misnamed ‘fajita beef’ from Prather Ranch, first cooked on Jun 15. Every month’s Prather Ranch meat delivery has ‘fajita beef’ included. Tonight we continued the tradition of using it for anything but fajitas! Again we dropped the beef broth. This time we ramped up the mustard (french, of course) and some how ended up with four serves instead of two! The other half of the asparagus from last night was 50c per serve. Dinner tonight cost $3.86 per serve. A repeat of the gyro wrap using the balance of the meat from Trader Joe’s. The semiSerious Foodies were in different places. Foodie Philip was out at the Alpha Dog’s Editors’ Lounge and pizza was supplied free. Foodie Greg stayed home and had the balance of the Spring Gnocchi. The crumbled blue was $3.49 for the container. We used half or 58c per serve. Dinner tonight cost $2.32 per serve, without the steak. With no chicken this week, and not wanting the gyro meat wrap two days in a row, we opted for smoked salmon on an onion bagel, with capers, tomato and cucumber as a closed sandwich. The tomato makes it a little wet, so we’ll likely drop that in the future. Thursday night steak night! 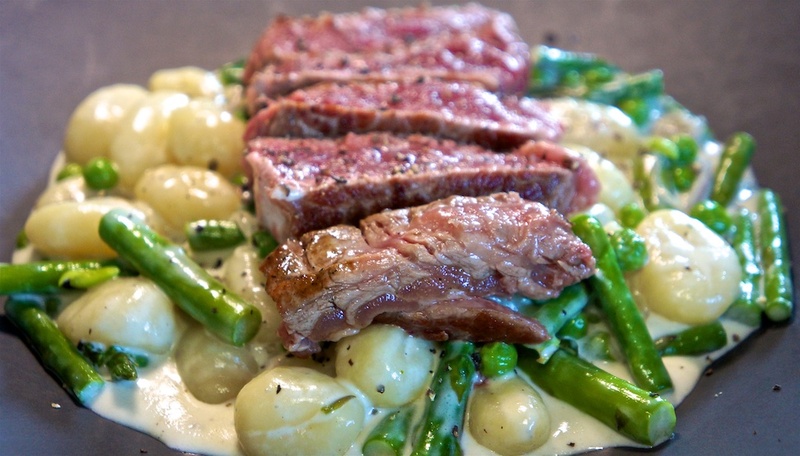 Tonight a Prather Ranch Rib Eye with a Creamy Gorgonzola Gnocchi, although we substituted Trader Joe’s Crumbled Blue Cheese for the Gorgonzola, because we couldn’t buy any at the regular outlets today. The Rib Eye was grilled to perfection (well, blue for us) on our cast iron griddle on the induction cooktop. That’s a perfect combination. The creamy blue cheese sauce with asparagus and peas was pretty damned good! Dinner tonight was definitely restaurant worthy and cost $11.67 per serve. Instead of chicken wraps this week, we decided to revisit the Trader Joe’s gyro meat for a wrap. Heated quickly in a pan on the regular cooktop. We’ve found electric to be generally faster and more controllable than gas, which is a surprise. It’s LACPUG night followed by pizza at Palermo’s in Los Feliz. We all put in for pizza. Dinner tonight cost $5 per serve. Another serving of sushi from Whole Foods, who seem to have changed provider since our last visit. Lunch today cost $7.55 per serve. Dinner tonight (and tomorrow night) cost $2.33 per serve. It’s an excellent dish and every time we serve it for someone, they want the recipe. Another Burbank Monday and another In and Out Double Double. It’s unusual that we eat out twice in the one day, but we were back in Burbank in the evening for drinks and a meal with a friend. Dinner at Gordon Biersch generally runs $20 per serve with tax and tip.